Yesterday I was fortunate enough to visit with a wonderful 83-old-man named Burford Ploughman. 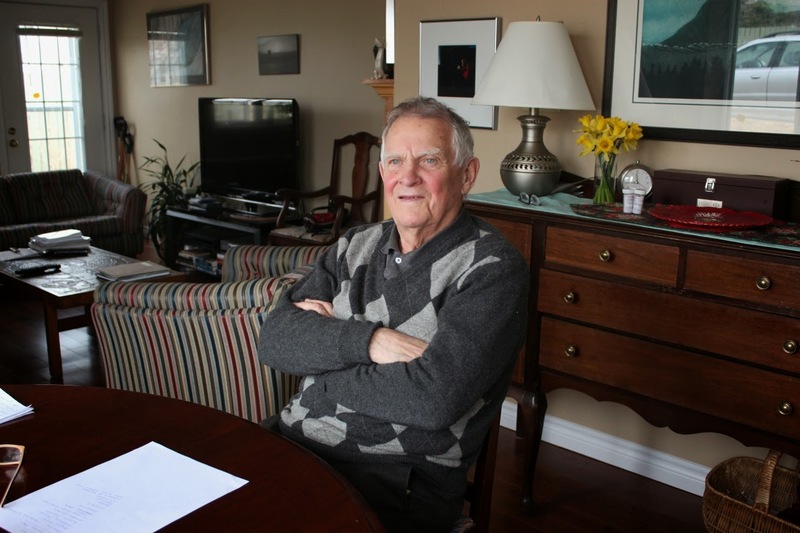 Knowing of my penchant for oral history, Burf invited me over to record his reflections on the some of the games and antics he and the boys would get up to in the Bay Roberts area in the 1930s and 40s. Originally from Coley's Point, Burford has a sharp memory, and can recall exactly what it was like to grow up in that area. From the early memories of his father keeping animals, to later times of living on Cable Avenue, Burford provided a detailed description of his youth. In his stories, he really emphasized the fact that the local boys were real pranksters, and luckily, the community was very tolerant of them. One particular activity that they got up to was, on the days approaching Bonfire Night, they would go out and "buck barrels." Bucking* barrels, I soon found out, is the act of taking (stealing) barrels from different families around town, to be used as wood for the bonfire. Burford explained (with help from the Dictionary of Newfoundland English) that bucking isn't like borrowing, as the object will never be returned to the owner, but it wasn't exactly stealing either. *Buck v To purloin; to collect or gather surreptitiously. He bucked a barrel last night for the bonfire on November 5th. Click here to visit the Dictionary of Newfoundland English. Like often the case during oral history interviews, childhood recollections were just the tip of the iceberg. Eventually we went on to discuss the fact that Burf ended up leading a most interesting adult life too. Without any specific ambition to do so, but because of his love for debating local issues, Burf became a talk-show host for a television show called Analysis. During the five years that he was on this show, Burf had the opportunity to discuss major issues with people such as Joey Smallwood--the most important political figure of that era. These interviews led him towards a deeper understanding of the political themes that were resonating throughout the province. His interest in achieving what he considers the best possible life for the people of Newfoundland continued throughout his career, and continues today. In fact, Burford was recently interviewed for Atlantic Business magazine (Mar/Apr 2014 issue) because of a specific vision he has for creating a transportation tunnel between Labrador and the Island. Like a true debater, he presents his arguments using clarity and logic. Burf Ploughman in his home, April 2014. What I enjoyed most about this oral history interview is the sense that Burf still marvels at what a grand life he has had. The wonder and joy could easily be read in his face throughout my stay. Our visit was recorded and will eventually be submitted to the Digital Archives Initiative so that it will be publicly accessible. I plan to visit for a second time, to go into more detail about the games that children would play back then, and see if Burf can recall for me some the rules and different ways of playing. It is guaranteed to be an interesting follow up interview.